Wn27 Saint-Aubin-sur-Mer, K.V.U.Gr Riva-Bella, K.V.Gr Caen. 5th und 9th./ 736 I.R. Hauptmann Rudolf Gruter. 1 x Peilstand for batterie 7./1716. 2 x 5cm KwK L/60 Pak. 2 x 2cm Flak 30 on roof of house. Covered ringstand for a 5cm KwK L/60. 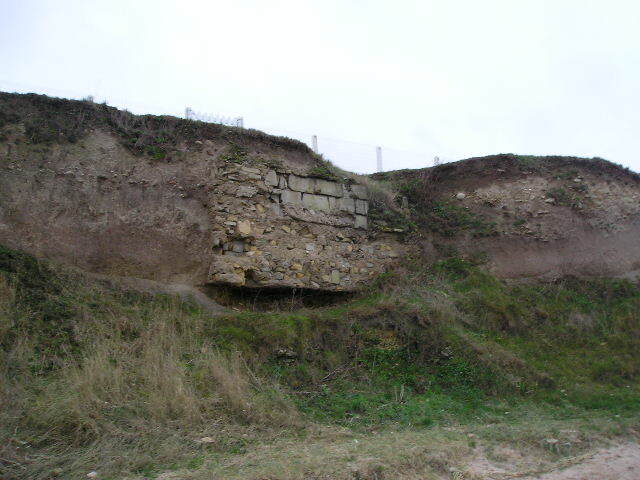 Most of the Wn Widerstandsnest defences along this coast. A defended house along the D-Day coast..
Unterstand ---- larger than Soute. Tobruk --------- M.G. open emplacement. Infermerie ----- Small hospital/casualty clearing station. House with the 2cm Flak on roof. 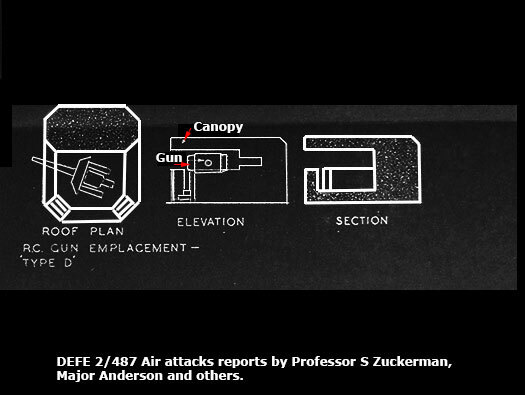 The Allied Bigot map shows two Flak on roof. Details found around the 22nd June 1944. From Wn27 to the east. 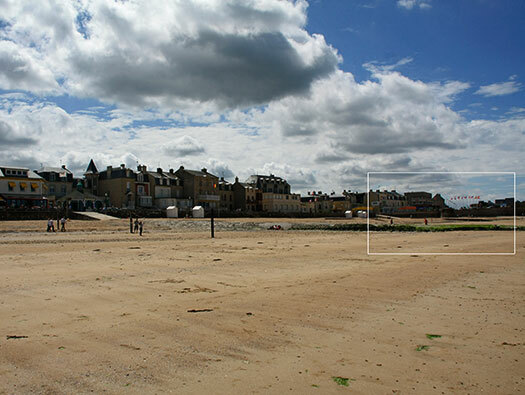 How the beach may have looked. The thick lines are a minefield with Mf.49 west, Mf.51 east and Mf.50 inland. 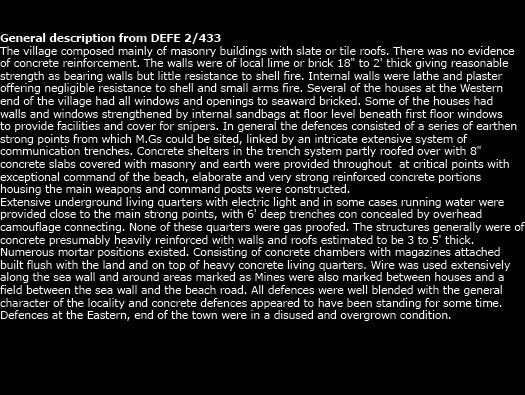 I believe these are code names of defended houses along the sea front and the quantity of mines and types. Bär, Dachs, Marder, Schneeglöckchen, Georgine - to the west. And Gladiole, DruckBohlen 1, Primel, Esche, Rose, DruckBohlen 2,Dahlie, Tulip, Eiche, Aster, Linds, Nelke, Löwe, Wolf, Jltis, DruckBohlen 3, Hase & DruckBohlen 4 to the east. A Machine gun position that is the sort that may have been built along the coast. This could be the above view on D-Day. 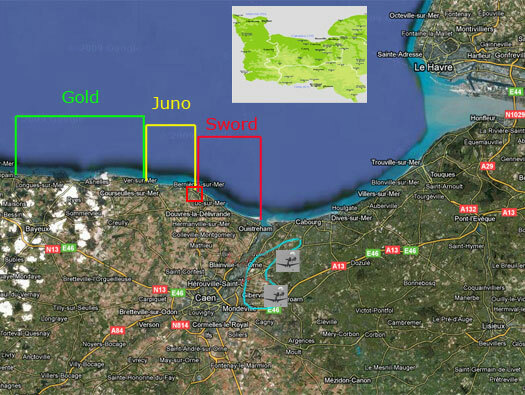 Roughly speaking the Canadian front of assault extended from Vaux to St. Aubin. The infantry opposition encountered on the 6th June was furnished in the main by the 2nd Bn. 736th Inf. Regt. of the 716th Inf. Div. ( Historic Section (G.S.) Army HQ Ottawa). Wn27 main defence was around the old Saint-Aubin Roman fort, a structure now I believe completely removed and to the right of the flags. Plan of the defences and trench system. 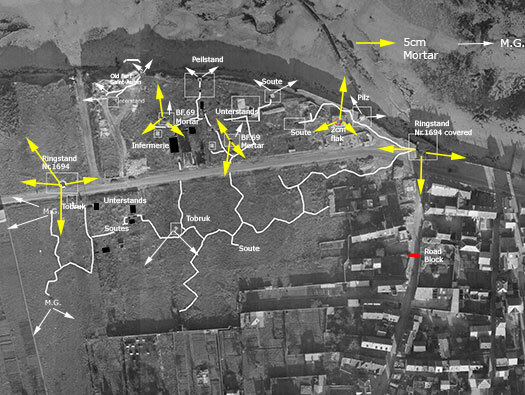 An air photo showing many houses removed and a full trench system. 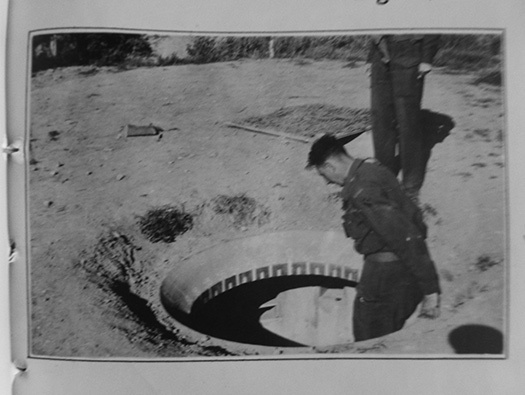 These trench systems became very useful to the Germans as they could infiltrate around attackers and attack their rear. 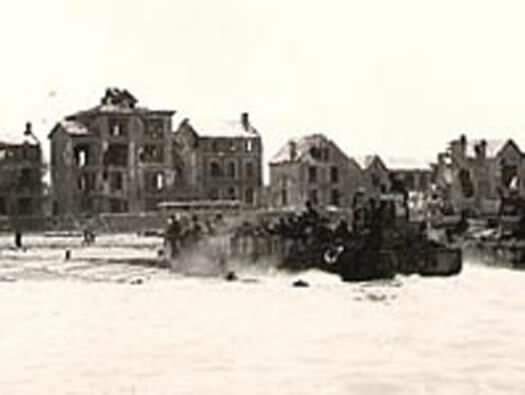 The USAAF Thunderbolt and the Sherman tank on the beach. 5cm KwK L/60 Nr.1697 Ringstand covered emplacement. Usually an open emplacement but as it would face an attack directly from the sea, a shield has been built up around its seaward side and a cap to give some cover from above. 5cm KwK L/60 Nr.1697 Ringstand covered emplacement. 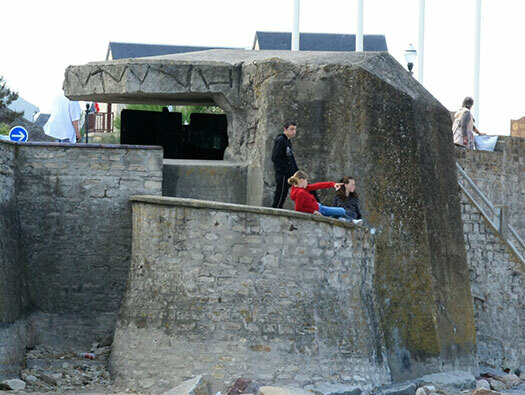 This shows how the gun and crew are covered by the thick concrete outer wall and the lid. 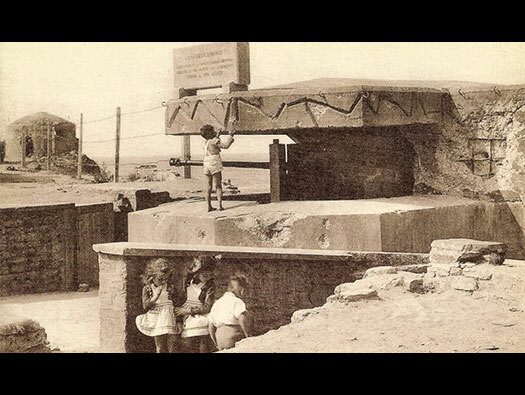 Below the children there was a slit in the half round wall and this MAY have been a machine gun position?? A plan made for Allied intelligence. 5cm KwK L/60 Nr.1697 Ringstand covered emplacement as seen from the sea. I believe the small extension to its left may have been a flanking machine gun pill box?? 5cm KwK L/60 Nr.1697 Ringstand covered emplacement showing the original Nr.1694 ringstand and the extension behind. Unfortunately this emplacement was attacked on D-Day not from the sea but from the landward side, exactly as the makers did not envisage. Note the direct hits to the right side and on the lip of the emplacement. Nr.1694 ringstand for the 5cm KwK L/60 gun with lid. 5cm KwK L/60 Nr.1697 Ringstand covered emplacement showing the built in camouflage on the roof. Odd pieces of wood set into the concrete as it was being poured and then removed when the shuttering came down. 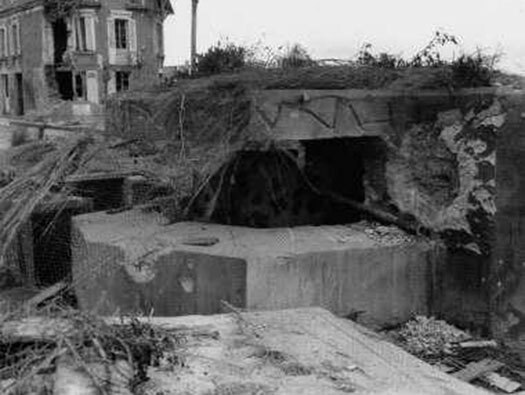 This gun could fire down each flank and also Rue Canet where there was an anti-tank wall made of large tree trunks set into the road. 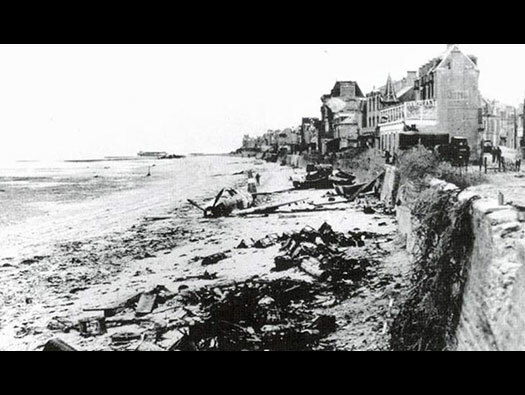 A very common photo of Post War France with the detritus of allied equipment washed up on the shore, a crashed USAAF Mustang and behind it a Sherman tank. On the wall hanging over I think is a camouflage or fishing net. The Sherman tank. It may have been a DD tank. DD Sherman entering the water showing the floatation skirt erected. Invasion stripes on the plane. 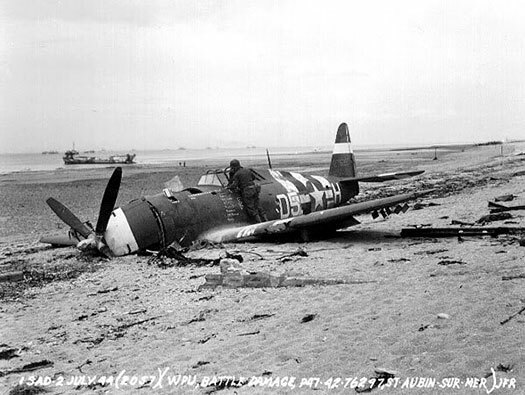 02 July 1944 photo of the wreckage at Wn27 Saint-Aubin of a P-47 Thunderbolt that was shot down 10 June 1944 on a mission to Cherbourg, France. Captain Bob Gerhart, a former wing controller, was appointed CO of an independent ASR spotter squadron. The controllers based at Saffron Walden would have direct contact with the spotter planes and rescue launches. The aircraft, ground crews, pilots and all the equipment necessary had to be borrowed from other fighter groups. Because Hub Zemke was a very respected fighter leader he was asked to provide “war weary” aircraft and a piece of ground at his Boxted base for them to use. Bob Gerhart started with 90 enlisted men from 16 different stations, 25 pilots and ground officers “loaned”, no hanger and virtually no tools. Fortunately Zemke and his executive officer, Dave Schilling, were fully behind the idea, and loaned and scrounged as much equipment as possible. So barely a week after the conference, detachment “B” of the 65th fighter wing had flown its first mission. 5th Emergency Rescue Squadron A 5F at RAF Boxted showing the colour scheme. 5th Emergency Rescue Squadron USAAF. RAF Boxted Opened in 1943, it was used by the United States Army Air Forces (USAAF). RAF Boxted has the distinction of having been the airfield for the two most successful USAAF fighter groups in air-to-air combat closed 1947. 5cm KwK L/60 Pak in reasonable condition considering it went through a war. Two niches can be see where ready munition was stored, the rest of the ammunition would have been man handled down the trench and handed into the gunners as needed. Not damage to the roof where I feel an armoured piercing solid shot fired from a tank, ricochet from the lip of the emplacement and off the inside of the roof?? 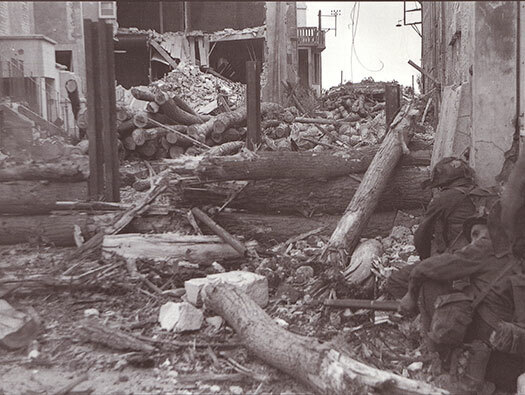 Canadian troops of “B” Company, North Shore (New Brunswick) Regiment, take cover behind steel girders and logs guarding the approach to the German strong-point WN-27 in Saint-Aubin-sur-Mer, 6 June 1944. 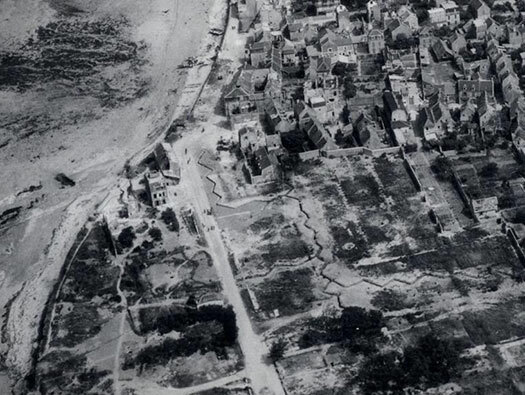 D-Day around mid day, the men here had to fight off the beach, continue inland along the coast road and down the Rue Carnet. Here were several steel stakes set into the road surface and covered in tree trunks. Tanks helping the soldiers blasting the trees out of the way and then engaged the 5cm gun where the evidence of that battle can still be seen today. Canadian officers in a trench. 75mm round from a Sherman tank fired down the Rue Carnet. 75mm stacks of Sherman shells. 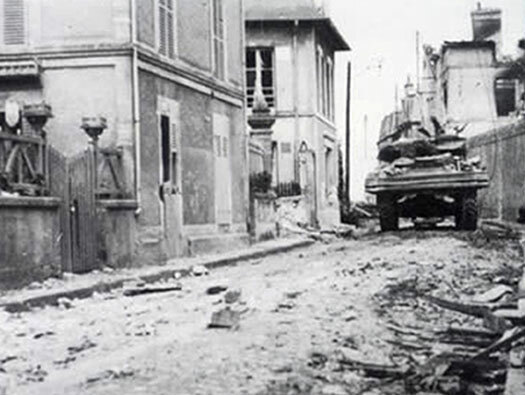 A Sherman DD tank waddling its way down the Rue Carnot. Looking back down Rue Carnot today a nice peaceful street today where the tanks and Canadian troops came. How the gun emplacement looked soon after capture, the shell from the Sherman can be seen with very fresh marks. Another shell ricocheted off the rim and up into the roof and a mark can still be seen today. But as these I think were armoured piercing solid shot rounds, they did not burst. 5cm L/60 in an open emplacement. Artist watercolour by Capt. O.N. Fisher. 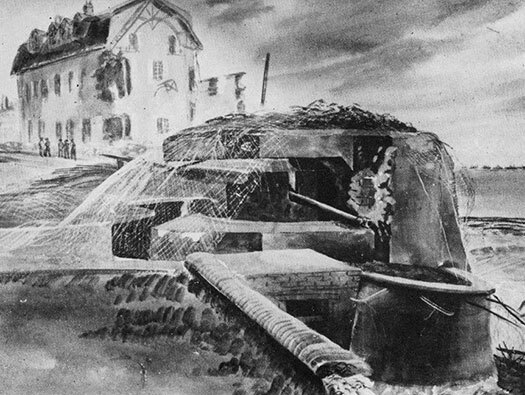 With tank support ´B´ Company neutralise the gun emplacement. 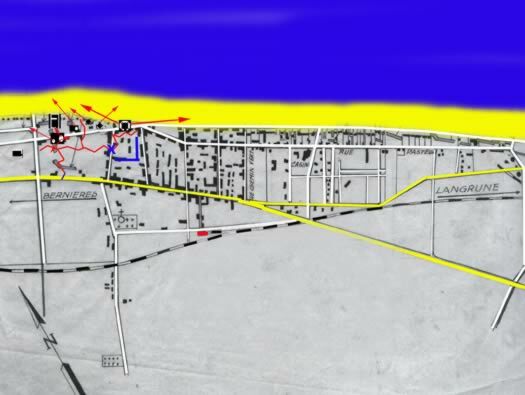 By the time ´B´ Company secured their area of the beach seventeen North Shore men are dead and wounded from sniping and shelling. The gun has also taken out an estimated 6 Canadian tanks. Tank fire brings out white flags from the German soldiers but as troops move towards them they open fire again. More casualties but nothing could stop North Shore now. Their response when the German army wave white flags again is bombs and gunfire. 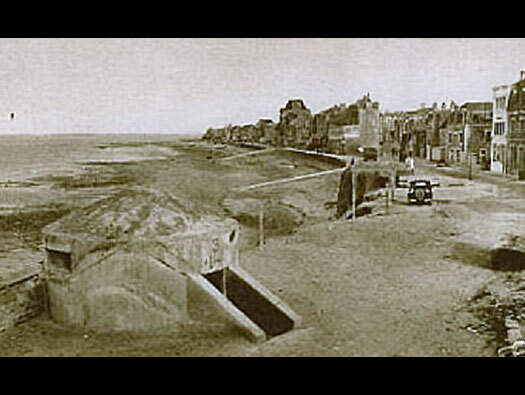 With the support of Carrier Company they begin to clear the town and thoroughly inspect the tunnels and bunkers of Saint-Aubin-sur-Mer. By the time they have finished four enemy officers and 75 other ranks are taken prisoner. Fifty of the enemy have been killed or wounded. (From Normandy Then and Now). Another painting of the capture of the gun by A Handy. 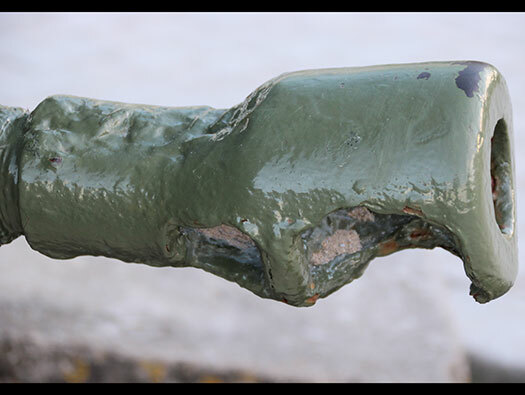 The muzzle brake is damaged (twisted) probably after receiving a shell of 75mm Sherman that definitely has prevented it from continuing to shoot towards the beach. The gun fired 70 shells. The shell cases were counted. The three guns crew were killed in the bunker, either by a Sherman shell? or small arms fire from Canadian soldiers? We do not really know ! Their bodies remained in the bunker for three days, according to some civilian witnesses. Canadians who "cleaned up" WN 27 used a flame thrower in an underground bunker and burned seven particularly vindictive infantry men who refused to surrender. It seems, moreover, that there were few survivors of WN 27. 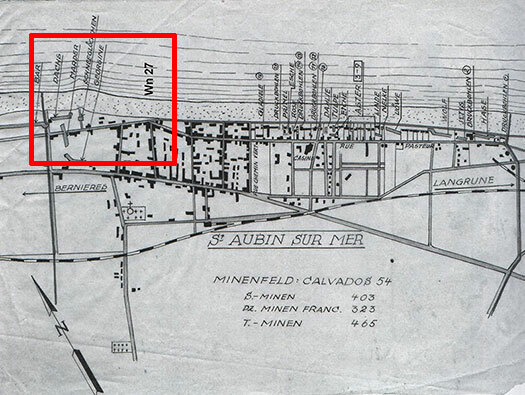 The 75 prisoners said to have been captured in Saint-Aubin include, in addition, WN soldiers from 28 and 23, is most likely. 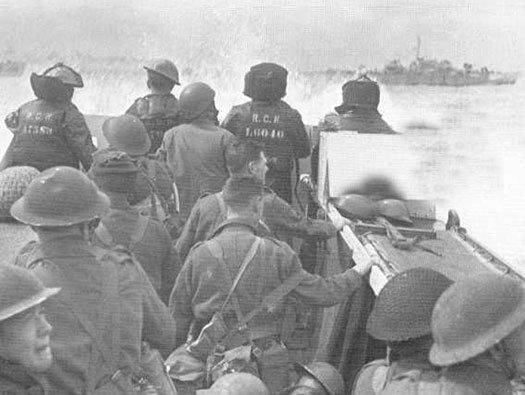 Canadians were not very willing to spare the enemy after the big losses on the beach. And we can understand them. They had themselves 96 killed at St Aubin. Thank you very much Jean-Pierre for your detailed local knowledge. Where a tank round may have hit the Muzzle Break. Pilz the pill box that has now been removed to make room for the war memorials and flag posts. Machine guns and rifles could be used inside. The site of the Pilz. A post card of the 5cm and the Pilz still in position. Also it is seen before the road level has changed. 8.14cmGr.W.278(f) mortar Tobruk type BF.69. 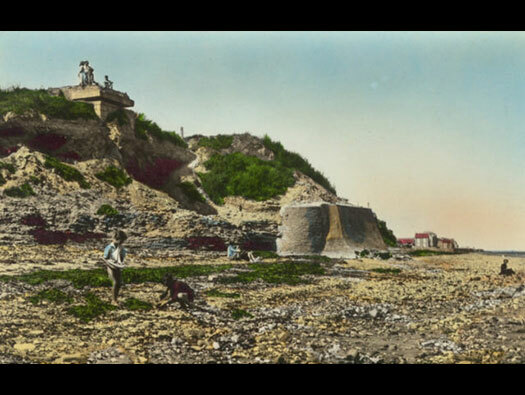 Fort Saint-Aubin remains and the Peilstand above. This observation (not really a fighting position) could call down fire from 7./1716 batterie of 12.2cm s.F.H.396(r) guns inland. (The guns were captured Russian guns). Further along was the Roman Fort this maybe remains of the fort. 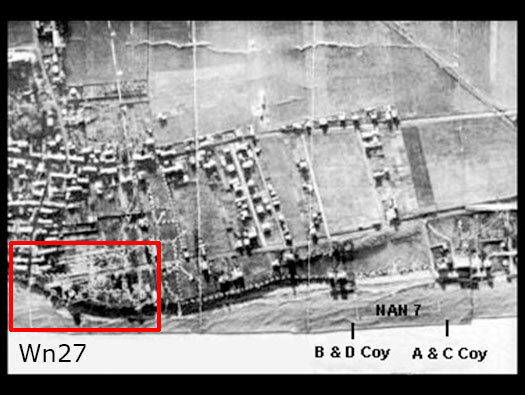 This is the position of the batterie in question Wn28a from an allied document dated 1943. 4 x 12.2cm s.F.H.396(r) guns. Ammunition was stored in he woodland and the guns in open earth emplacements. 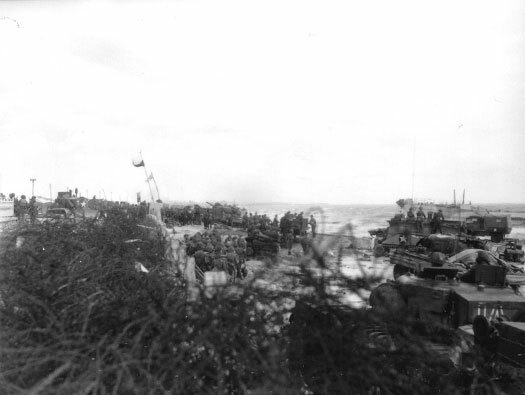 12.2cm s.F.H.396(r) about to be towed away by its horses..
Landings took place here by the North Shore Regiment on Nan Red Beach. 48 Royal Marine Commando followed and helped them to fight off the 716 Inf. 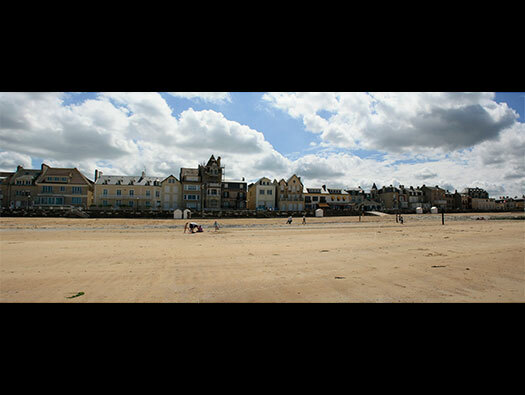 Reg to take Saint-Aubin and then moved on to Wn26 Langrune-sur-Mer. 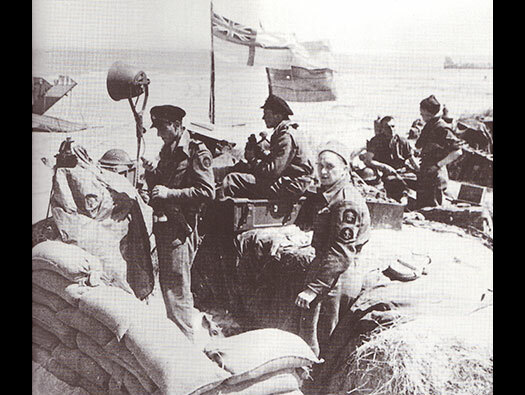 North Shore Regiment on Nan Red beach. Nan Red beach later on. Nan Red beach. Naval beach control parties directing traffic off the beach. Although left on the beach and not used in the initial advance inland. These troops and Naval personnel took a lot of casualties from shelling and sniping. This picture must have been a bit later as they are not wearing their steel helmets. A lovely old tiled road sign still on the wall.